I have to admit, his large swaths of color, with their soft edges and meditative yet simple rectangular shapes do elicit feelings in me. But not, perhaps, what he intended. 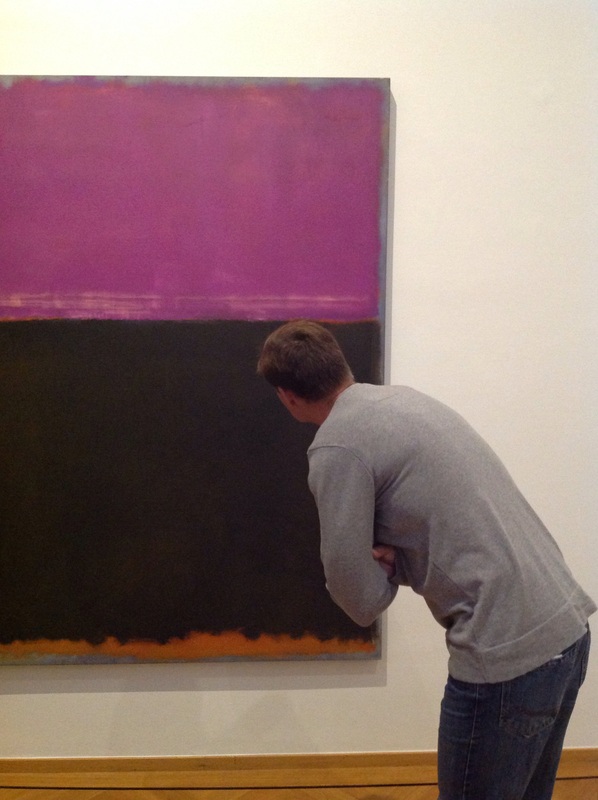 We have seen Rothko exhibits before in San Francisco, and I’ve seen a sampling of his work in New York as well. But never before have I spent so much time contemplating them, and letting the colors and feelings wash over me. My tendency, as a social female and a writer, is to write about the art I see and to discuss them in terms of color and shape. But as I read about the artist, I soon realized he had an aversion to people trying to convey his art through words. 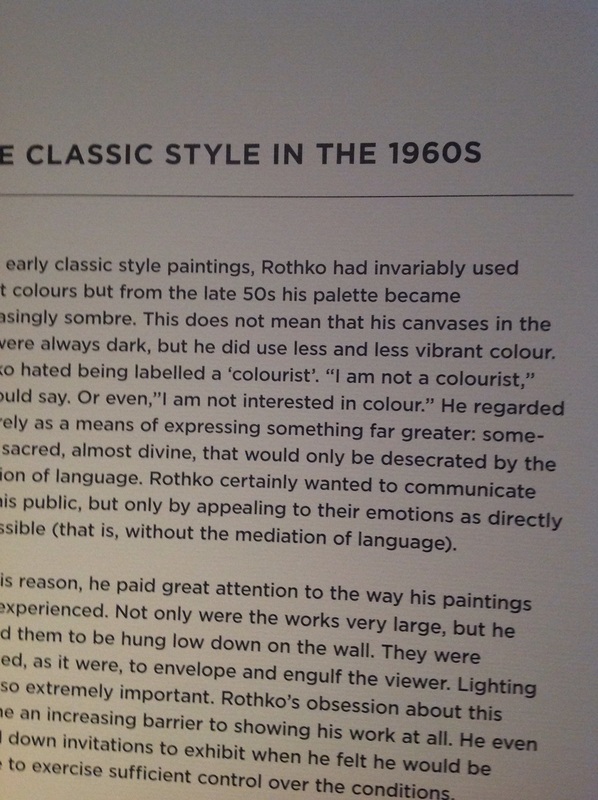 Words, according to Rothko, desecrate the art. And they are not about color either; they are about the emotions; about a personal relationship between the painting and the viewer and the emotions that are evoked. They are intentionally hung low on the wall, so the viewer can “step into” the painting, and really experience the art. As if to drive his point home, all of his works are untitled, as in the name of the paintings are Untitled, followed by the year they were created. Thus, without a title, we lean toward a description through color. “The one with the purple on top and black on bottom edged in orange.” More words, not feelings. But colors are known to be associated with feelings and terminology. Red: anger, passion, danger, love. Gold: regal, wealthy, happy, holy. You get the idea. Colors are also a language of emotions. Yet who is to say if these color associations are universal? 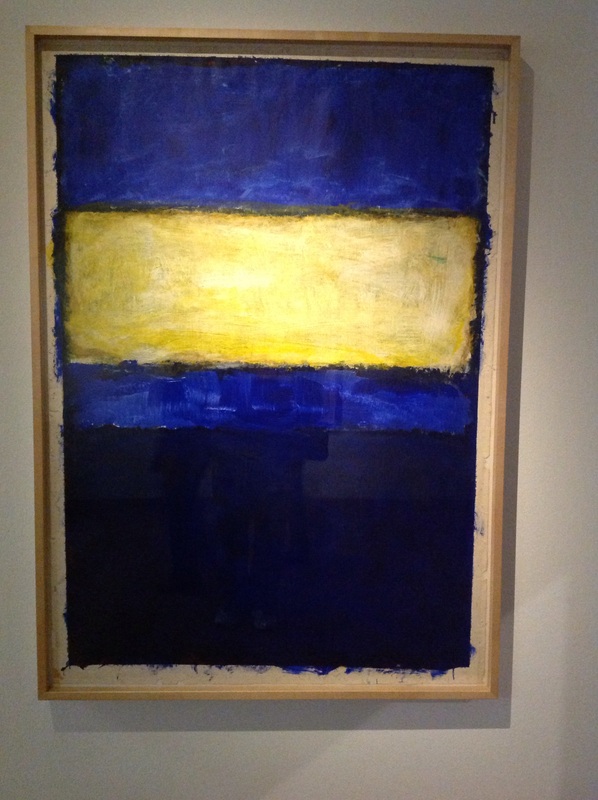 Take this untitled cobalt blue and gold Rothko painting above. What do you experience when you see it? For me, I see a spiritual work of art. 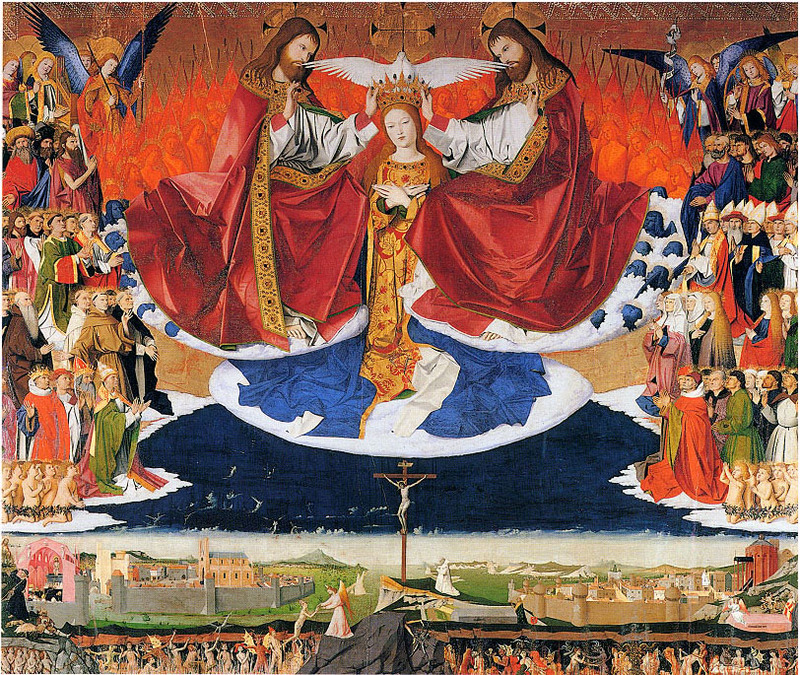 The gold rectangle in the upper third pulls to my mind the halos encircling the heads of angels and biblical figures from the fifteenth century a la Corination of the Virgin style (right). The deep cobalt blue reminds me of opulent gowns and the richness of a night sky. But my associations have a lot to do with my Catholic upbringing and my western orientation with color and art. How would a Muslim woman or man experience this Rothko painting? Or a Hindu? Or someone with a western upbringing who has never entered a church in their lives? Or how about the happiness and warmth I felt BEFORE I listened to the commentary about this painting. It was one of Rothko’s smaller canvases that he painted during a period of depression, right before he swallowed pills and slit his wrists, ending his troubled life. So much for the happiness that had enveloped me. 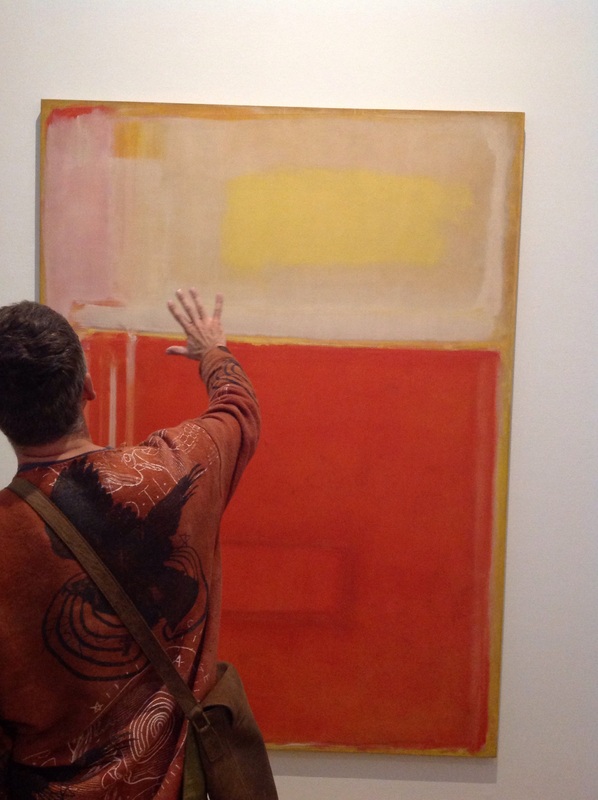 What was Rothko striving for in his paintings? As observers, we like to discuss the art. Take this man for example; he stood before the painting, gesturing with his hands, explaining a concept to his son–a concept that was not laid out in the untitle of the painting or in the curator’s interpretation of the art, as these were rather non-existent. So for an artist who didn’t want to be categorized, refused to participate in many group shows, and was very controlling of how his art was presented, what was he actually trying to convey? “I am not interested in colour.” He regarded color as merely a means of expressing something far greater: something sacred, almost divine, that would only be desecrated by the introduction of language. When I read this, I imagine a man who was extremely controlling and difficult, but also a man that strived to connect in a beautiful way–through the core; trying to touch the essence of what makes us human. I liken this to the conundrum that is meditation; we can talk all we want about how to do it, but it is in the practice of meditation and the silence of the mind that we get to the essence of spirit. I imagine Rothko would like us to experience his paintings in the same way: Stop talking, be in the moment, step inside my painting and experience the emotions waiting there to engulf you. Sorry Rothko, I’m using words again to imagine your artistic desires and to say just how much I appreciate the feelings you evoke in me through your art. It’s been 40 years since such an extensive Rothko exhibit came to the Netherlands, so don’t miss your chance! Rothko’s work is on display at the Gemeentemuseum in The Hague through March 1, 2015.